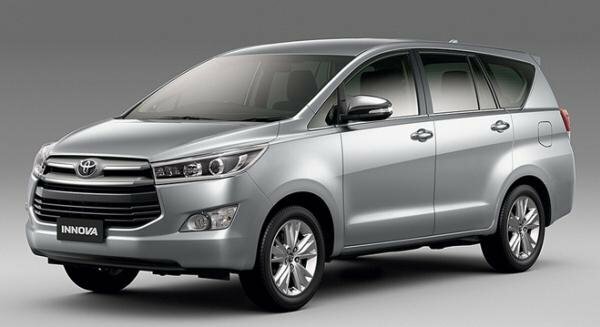 Uncover latest price, specs, interior, exterior, pros & cons in our comprehensive review for the Toyota Innova 2018 Philippines. Born to take charge of the Toyota Revo in 2005, the Toyota Innova has actually performed well, even has lived up to expectations up to this moment. Having passed through over 12 years, but the Toyota Innova is now stopping at the second-generation, which was launched in the country on February 26, 2016. It’s certain that all Innova fans have been craving strongly for a third-gen Innova. Sadly, the brand still keeps silence. For those who’re extremely into this MPV but cannot wait for the next-gen model, our Toyota Innova 2018 review will help you find the most suitable in the current lineup. 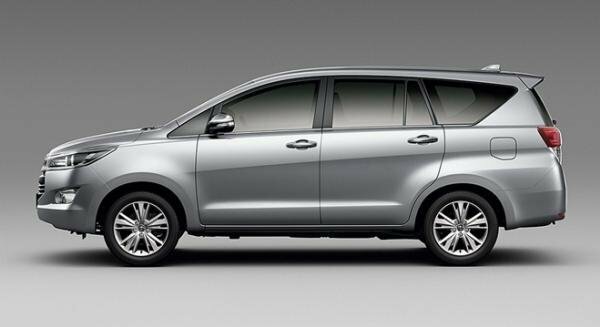 As many of you know, the Toyota Innova has known to be a practical family car or people carrier nationwide. 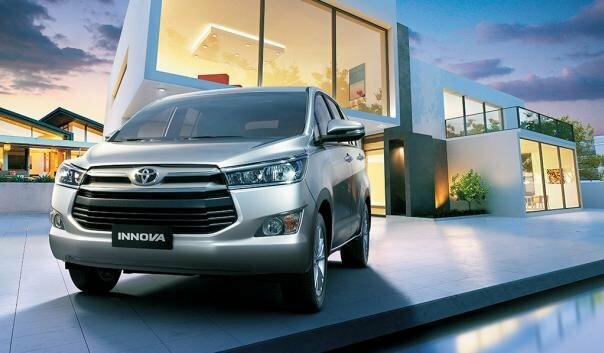 Topping the MPV sales charts for over 12 years in the Philippines, the Innova is confident of conquering our heart thanks to its top qualities. 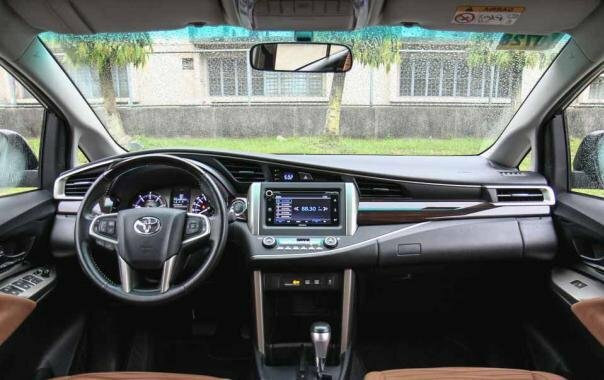 All members in the Innova lineup are brilliant but today, Philkotse.com will choose the top-of-the-line Toyota Fortuner 2.8 V AT 2018 to analyze. Now, let’s get started! How much a Vios, Fortuner, D-Max, and Innova will cost in 2018? Toyota Innova & Mitsubishi Montero Sport: Which one do you prefer? Comparable to the first-gen Innova, the Toyota Innova 2018 model features a glossier and more sophisticated look, which makes the vehicle resemble a strong SUV rather than a true MPV or AUV. But anyway, remember that the Innova is definitely not a showy car. Instead, it is the hidden abilities that make Filipino drivers respect. Put your focus on the lightings first. 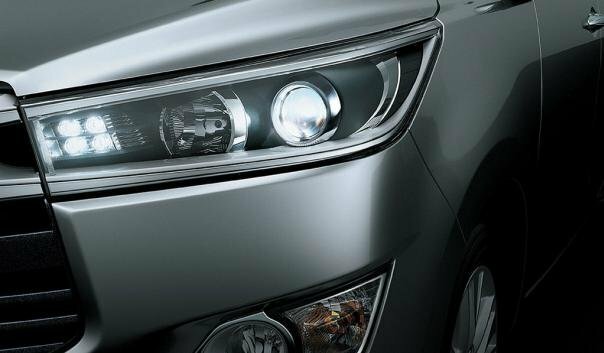 In fact, you will found “a new way to see the road” in the second-gen Innova with all-new lighting system. Precisely, the LED projector headlights are now mounted lower and flank the two-bar chrome front grille sitting near the modified fog lamps, exuding both style and function. The taillights, in the meantime, get wider and possess a more alluring look. On the whole, not only do the lights keep you safer driving at night, they will also catch attention of other commuters on the roads. Trust us! The side facet seems to be the same as that of the predecessor but it’s now accompanied with striking wheel arches bordering 16-inch alloys, side indicator integrated outside rear view mirrors and chrome door handles. Besides, can you see a usual slight kink and a unique beltline flowing along the length of the car? When it comes to the rear, we will be struck by a robust body structure with muscular rear bumper, black pillars and a big tailgate. Also worth noting is the rear mirror which is beautified with a rear spoiler and a Toyota emblem that further enhance the car’s exclusivity. 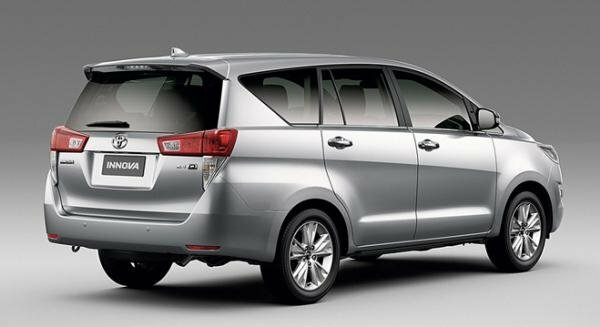 For the most part, the front, rear and side profiles have been all well reworked to give the Innova a more aggressive stance and masculine traits. With regard to exterior dimensions, the 2018 model is taller and longer than the previous Innova. In detail, it measures 4,735 mm long, 1,830 mm wide, 1,795 mm tall and a long wheelbase of 2,750 mm. Owing to the changes in size, a great amount of space inside has been remarkably saved. 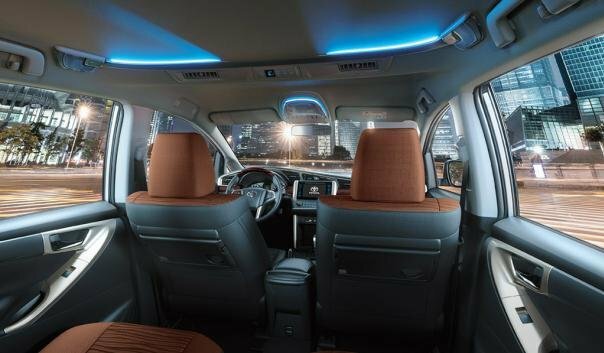 The Toyota Innova 2018 interior, as its name indicates, is a room that has been “innovated” to suit all rides you take. 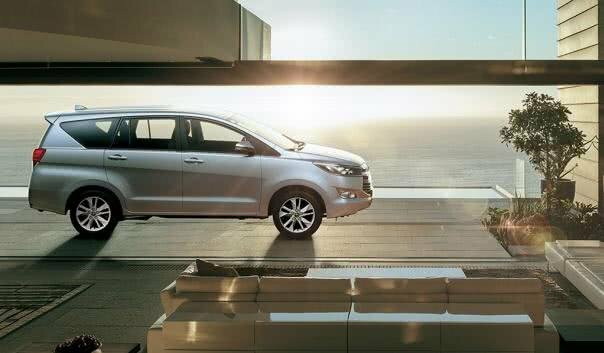 Broadly, from the illuminations to the space, the Innova will never make you and your family disheartened. First, fix your gaze at the excellent dashboard which is reminiscent of premium vans. In addition to that, faux polished wood trim pieces, metal highlights and other soft materials also help do up the cabin. Next, the Optitron analog gauges are also new in this second iteration. Let alone the legibility, they are likewise much easier to monitor. On top of that, a LCD multi-information display showing average fuel consumption, outside temperature along with eco-score display is also set up. 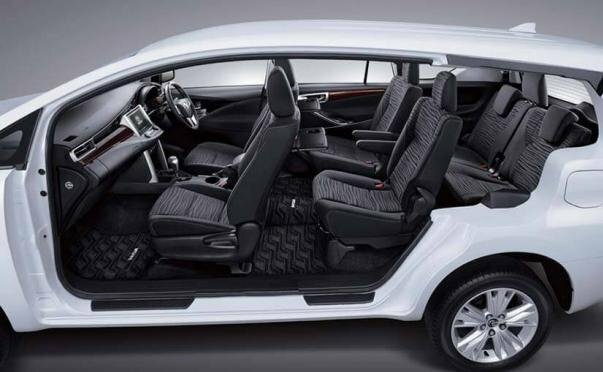 In the matter of seating capacity, due to more upright grille and hood, driver is able to see what’re going on at the front car while sitting on the driver’s seat. Plus, the steering rack can be flexibly adjustable while the seats bring in a bevy of configurations for all wheelmen. Playing the role of a top-spec model, the Toyota Innova 2.8 V AT 2018 is spoiled with very comfortable captain seats at the second row. This special privilege is exceptionally helpful during long trips. Also, access to seats at the third row is now a pushover with only one touch tilting 60/40 split captain seats. By the way, the third-row seats are spring-loaded for easier hand stowing. In lieu of fastening up the seats on grab handles, seats are hooked itself on the D-pillars. The Toyota Innova 2018 model boosts a very large cargo space of 300 liters in the usual way. When the third-row seats are folded, the cargo volume will be increased to 758 liters. Want to carry more stuff? Bend the middle row as well and you will have 1128 liters to store baggage. In general, the Toyota Innova is a perfect MPV for loading heavy and large luggage, if required or it can be used by your family for long rides with suitcases and bags. Other amenities include a leather-wrapped multi-function steering wheel, an 8-inch infotainment system compatible with CD/DVD, AM/FM radio, iPod, Aux, Bluetooth connectivity and satellite navigation system. What’s more, the automatic climate control system is also ready for use together with ambient lighting, both creating a cozier feel in car. 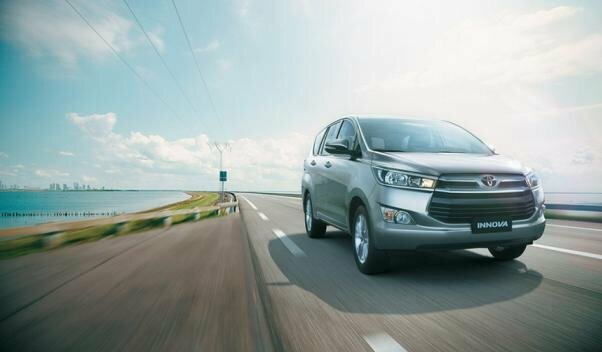 In the 2018 Innova, a bigger 2.8-liter 1GD-FTV engine will supersede the previous 2KD-FTV unit. 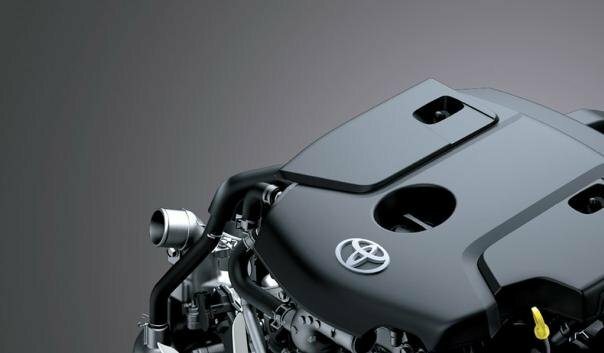 This new powerplant also powers the Toyota Fortuner and Hilux albeit a slightly modification. Accordingly, the mill generates up to 171 PS at 3,600 rpm and a peak torque of 360 Nm at 1,200 – 3,400 rpm. As you can see, while the old engine solely produces enough pulling power, this tuned one pushes out more loads of torque. To get this great MPV moving, only a light prod of throttle is as much as you need. Additionally, the powertrain comes fully with Normal, Eco and Power drive modes that enable the engine mapping depending on specific performance demands. In most cases, the Eco Mode should be set unless you are running on highways. 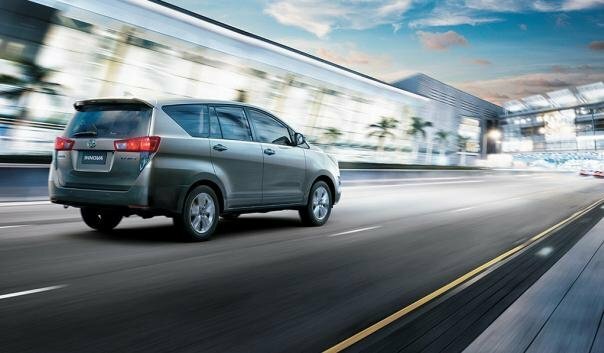 In terms of handling, the Toyota Innova 2018 model, although, is not as agile and flexible as a car-based MPV, it is still good to drive. The workhorse will make you fell solid and confident enough to challenge the tightest of twists. It remains a hydraulic power steering system which is not as light as electronic unit, yet that’s no bother. For a deeper feeling of driving this ride, try test driving it and don’t be shocked if you feel the car runs so smoothly that you could seemingly to fall asleep. The Innova is very eco-friendly. In city roads, it consumes only 11 km/L while on highways, the MPV guzzles 15 km/L at an average speed of 90 km/h. In case of heavy traffic, the car returns decent fuel consumption of 8 – 9 km/L. As mentioned above, the Innova is good but not perfect. Similar to the first-gen model, the new Innova is ideal for emergency stops. However, it is not effortless to slow down easily or stop the car completely in urban driving, in truth. One more thing to take into account is that the 6-speed automatic gearbox appears to hunt for gears when the vehicle is fully loaded with people and cargo, especially when running on expressways. To resolve this dilemma, throw the gearbox into manual mode or turn the Power mode on. In spite of being fondled with a long list of upscale and high-tech options, the range-topping 2.8 V AT only sets you back ₱1,496,000. This is exactly an affordable price tag when compared with other MPVs or minivans in the market today. But if you’re simply seeking for a simple workhorse, other lower-end variants are also worth considering. Now, let’s take a look at the table below for the latest price list of the Toyota Innova 2018 in the Philippines. All things considered, the Toyota Innova 2018 Philippines may not proffer muscular and sporty styling or reach the uttermost performance like its other rivals. But come to think of it, this MPV is one of the most practical everyday vehicles in the Philippine market nowadays. Wonder about buying the best family car? This is no doubt a good choice open to you. At last, via this in-depth Toyota Innova 2018 review, we have given you a better understanding of this noted MPV. So, will it deserve a spot on your wishlist?